A-Lock secures the email you type. ALL popular email programs. ALL Windows. SIMPLE! STRONG! FAST! A-Lock provides simple, strong, security for all popular Email software and text applications for Windows, without the need for any adapters, plug-ins, or accessory software. The free version of A-Lock never expires and decrypts any strength, but restricts the encrypt strength to passwords of 7 characters (56 bits). Purchase enables exceptionally strong passwords up to 56 characters (448 bits) in North America, and 16 characters (128 bits) Internationally. 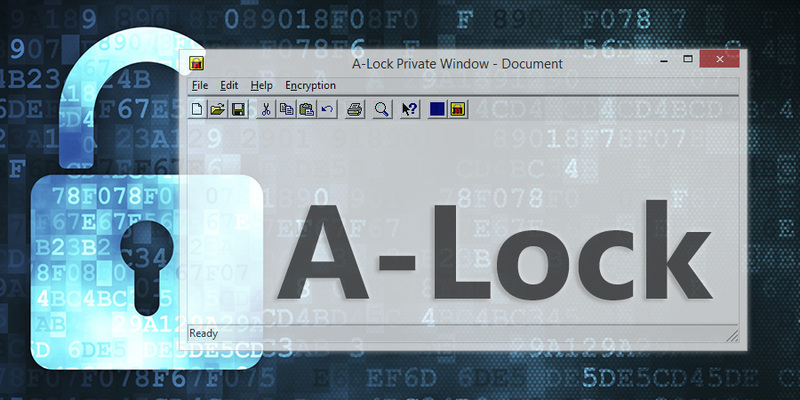 Installation of A-Lock results in the A-Lock icon appearing on the computer’s tray bar, next to the time indicator. You and the intended recipient(s) must share a secret password, which can be exchanged via telephone etc, or can be generated and securely exchanged via our free Key-Exchange service. To secure an email or text message, type the message as usual, then click the A-Lock icon, and choose “Encrypt/Decrypt (Auto)”. The text message will then be automatically highlighted, and a new pop-up window will appear asking for the password you wish to employ. Select the password either from the associated Password Book by clicking “Password Book”, or manually type in your chosen password. Click “OK”, and the message will immediately be encrypted. Send the encrypted email message as usual. The recipient also requires A-Lock. Upon receipt of the encrypted message, the recipient clicks the A-Lock icon on their computer, and provides the correct password when prompted. The decrypted message will then appear immediately in a “Private Window”, and all content remains secured unless it is then saved using the “Save As” feature. Alternatively, the option can be set to “View using External Viewer”, and in this case a decrypted copy is saved in the “Documents” folder residing in the same folder with the A-Lock.exe file. SIMPLE TO USE. FAST. RELIABLE. ALL WINDOWS. ALL EMAIL. SECURE ENCRYPTION using the widely recognized BLOWFISH algorithm. Never been cracked. ALL EMAIL PROGRAMS – AOL, cc:Mail, Eudora, Google Gmail, Hotmail, Lotus Notes, Netscape, Microsoft Outlook, Microsoft Outlook Express, Mozilla Thunderbird, MSN, Novell GroupWise, Opera, Pegasus, PocoMail, Walla Mail, Yahoo Mail, etc. Type message as usual, then click the A-LOCK icon on the task bar to Encrypt. Receive encrypted Email, and click A-LOCK to decrypt. Note that both sender and recipient must employ A-LOCK. AUTO-ENCRYPT/DECRYPT – no need to remember passwords. Encrypt files with a default password or select a name from the Password Book. For added security, and portability, carry the Password Book with you on a diskette. Free KEY-EXCHANGE – simplest method to create secure passwords and deliver securely by email to any other A-LOCK user in the world. Or you decide on a password, and share this by phone, fax, web page, etc., or via Key-Exchange. MULTIPLE PASSWORD BOOKS – any number of Password Books can be created and accessed. Several people can share the same computer and each person can have their own Password Book (each with a unique access password). Keep one password book for your many other confidential passwords – no need to remember – just access the locked, private, Password Book. PASSWORD BOOK BACKUP – simple backup and restoration of Password Book(s). ENCRYPTION SIZE: The unregistered version of A-LOCK is limited to 56 bit encryption, but will decrypt any strength. The USA and Canada registered version allows password up to 448 bits (56 characters). This is the equivalent of a public/private key of well over 7,500 bits.